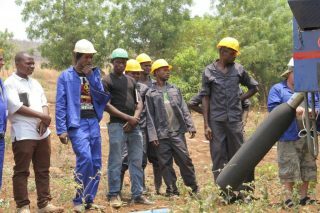 In October 2016 a team from the University of Strathclyde, Drilcorp and Water for People successfully sealed capped and controlled the flow from an artesian borehole in Chikhabado Village, Chikwawa District, Southern Malawi. 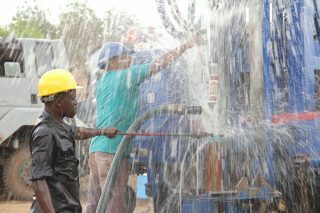 This is believed to be the first successful control of an artesian flow from a borehole in Malawi to date. Work on the borehole was set up as an open training session, to inform others working in groundwater supply in Malawi of problems associated with artesian water flows and demonstrate how to successfully control them. A total of 34 people from 10 organisations attended the training. Artesian Flows: If water flows naturally from a borehole without the assistance of a pump, this flow is described as ‘Artesian’. These flows occur when borehole drilling intersects groundwater which is trapped in a confined unit under pressure. the strata through which it passes. It is therefore illegal to allow an artesian borehole to discharge uncontrolled in Malawi! 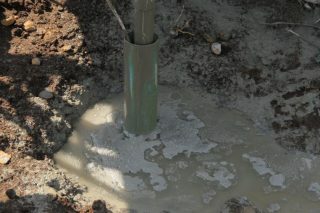 Despite this, artesian boreholes are allowed to flow uncontrolled. 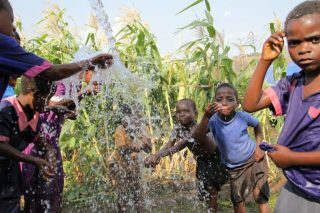 There are an estimated 150 to 250 known artesian boreholes in Malawi discharging uncontrolled, with many more unreported cases assumed. To control the flow from an artesian borehole, the borehole must be sealed just above the level of the artesian water flow and water directed up through a rising main pipe. At the top of this rising main a valve can be fitted to control the flow at surface. Sealing the borehole is usually done using a packer, a device which can be inflated against the walls of the borehole or casing to stop upwards water flow. The below diagram shows two ways an open artesian borehole (Ex1) can be sealed with a packer (Ex2 and Ex3). These two examples (Ex2 and Ex3) show generalised setups that could be used to control flow. 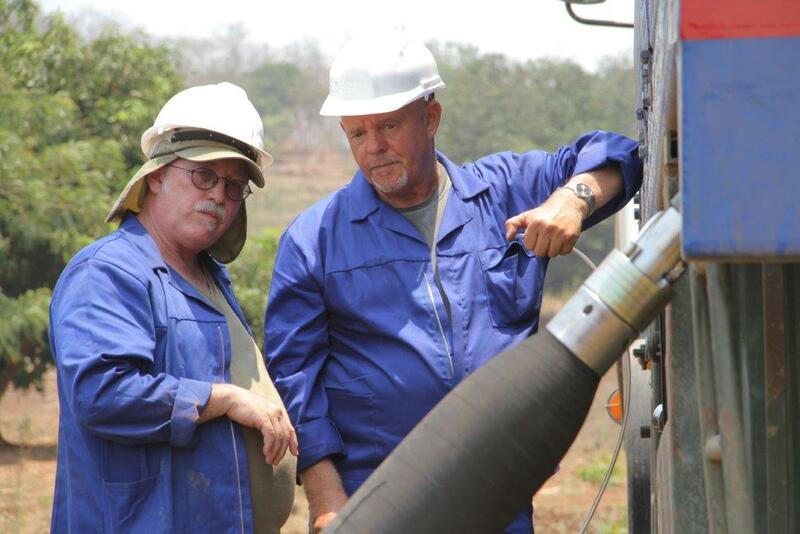 In practice, each artesian borehole will require a specific design tailored to the borehole. This can depend upon: the depth of the artesian aquifer unit, the stability of the borehole, the type of rock and sediment present, material and equipment available and any materials already in the hole. Once controlled, discharge can be managed appropriately and efficiently, with significant potential to use these artesian flows to supply large irrigation networks, including using water pressures to irrigate up-hill areas. This is discussed further at the end of this document. The artesian borehole sealed during this exercise is located in Chikhabado Village, Chikwawa District, approximately 12km east of Chikwawa town. The borehole was drilled on 14 April 2016. Drilling records state that the artesian water strike was observed at 31m depth, with an approximate initial discharge of 20l/s. Records state 100mm PVC casing was installed to a depth of 51m with slotted intervals at 18-21m, 30-33m and 45-48m depth, with a bentonite seal at 10m. The above drilling information is useful, but its reliability and consistency is questionable. The borehole has been flowing since, with discharge declining steadily to approximately 5l/s on 17 October 2016. This amounts to an estimated 200,000m3 of water that has been discharged since it was drilled. This represents an estimated 37 million m3 of rock material that could have been drained by this flow (assuming 0.5% open area). Local farmers have created an extensive irrigation network (dug channels), directing the artesian discharge to irrigate an approximate 61,000m2 of land. This activity represents a significant use of the available water, however even with this irrigation network; a significant amount is being wasted. Training: Throughout the work on the borehole (outlined below) Dave Gowans (Drilcorp), Bob Kalin (UoS) and Nick Mannix (UoS) provided on-site training to a total of 34 people from 10 different organisations. This work included short presentations on the issues of artesian water flows, methods of sealing and our planned approach. This was followed up with guidance and training on; the use of packers, data collection, site safety, cement grout mixing and installation, compressed air tests, yield and chemistry testing amongst others: these were undertaken throughout the works. The attendees were also given step by step guidance to each task being completed and were able to see all equipment and methods first hand. Prior to works commencing, a visit was made to Chikhabado Village on Monday 17 October. Attempted to remove the 100mm PVC casing using packer and compressed air, it was not possible to remove casing using these methods. Additional compressed air fittings required. A series of compressed air tests were completed, generalised setup shown in the above. These tests are used to a) flush material from the borehole annulus to free up casing, and b) test the ability of any annulus fill material to hold pressure. 7 compressed air tests were undertaken between 4 and 25m depth (15 minutes each). These tests demonstrated that even under very high pressures, air and water were not able to pass up the annulus of the borehole, confirming that a suitable impermeable seal is already in place in the borehole annulus (outside casing), as per plan B of planned work programme. The impermeable material forming is assumed to be composed of a) material from the confining layer (clayey sediment) which has fallen back against the 100mm casing and b) any bentonite or fill material installed into the borehole by the original drilling contractor. This proved that a suitable annulus seal is already in situ which can prevent artesian flow travelling up the annulus. There is no requirement to remove the previously installed casing. Once packer in place and inflated, the inside of the 100mm casing was filled with bentonite cement grout (using a tremmie pipe and pump), and after the outside of casing (annulus) filled with bentonite cement grout. Diagram of final packer and grout installation shown below. The cement grout installed into the borehole was given a minimum 10 days to cure, before an apron and surface structure was completed. It is expected that pressure at the borehole will be monitored every two weeks. This data, will allow the long term discharge potential from the borehole to be understood, including identifying any decline in pressures over time, or increasing pressures associated with rainfall recharge during the rainy season. It is now possible to now use this controlled artesian flow to expand the irrigation network at Chikhabado. With a suitable pipe installation it will be possible to irrigate up to 2.5m up-gradient from the borehole. This will allow an additional 30,000m2 (approximate) area of land to be irrigated. This work is currently on-going, and will be fully reported when complete. Lessons learnt: This training exercise managed to raise awareness and understanding of artesian discharge issues to 34 professionals working in the Malawi water industry in 10 organisations (including Malawi Government Ministries). It is expected that when artesian water strikes are encountered in future, these will be controlled appropriately, and their flows can be harnessed to efficiently irrigate large areas of land. There now the expectation that it will be possible to return to the known existing artesian boreholes in Malawi to control flow from these as seen here. 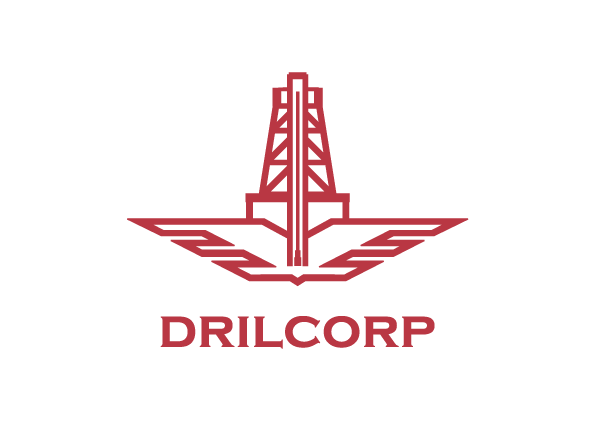 Special thanks to OG Madzi Drilling Contractor for providing drill rig, compressor, materials and staff for this exercise, and to David Gowans (Drilcorp) for his excellent training and guidance throughout.